We just got back from a quick trip to LEGOLAND and Disneyland last month and I was so worried about all the walking. 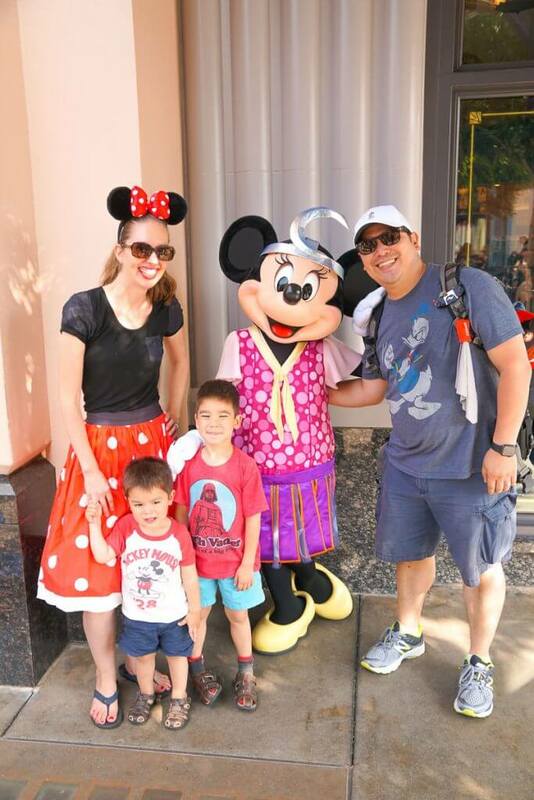 I did a ton of research about the best shoes to walk around Disneyland and LEGOLAND so I could keep up with my kids! See, I keep tweaking my back (I feel so OLD) picking up my heavy kids. My toddler needs help in and out of his crib and car seat multiple times a day. All that twisting and lifting has done a number on me. I was a bit nervous about being on my feet all day at two different theme parks. reached out to me to invite me to test out their custom sandals and insoles. What are Wiivv Custom Sandals? 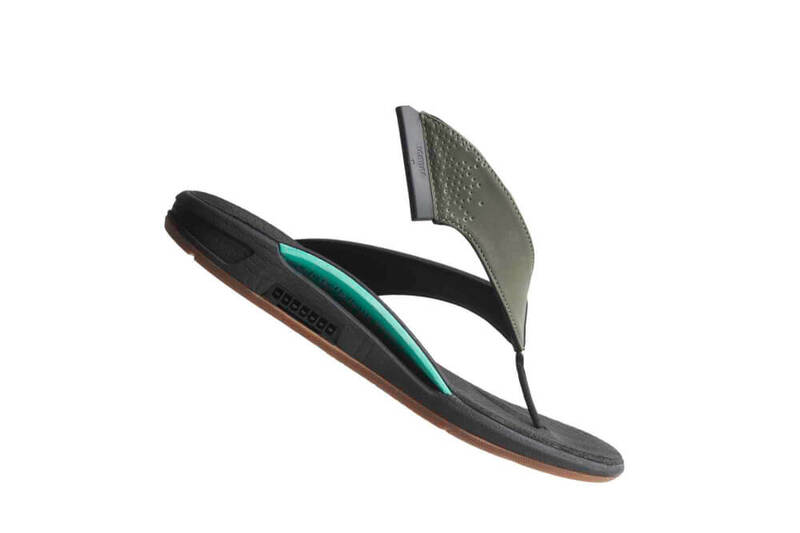 makes sandals that are designed to fit your foot, no matter what. 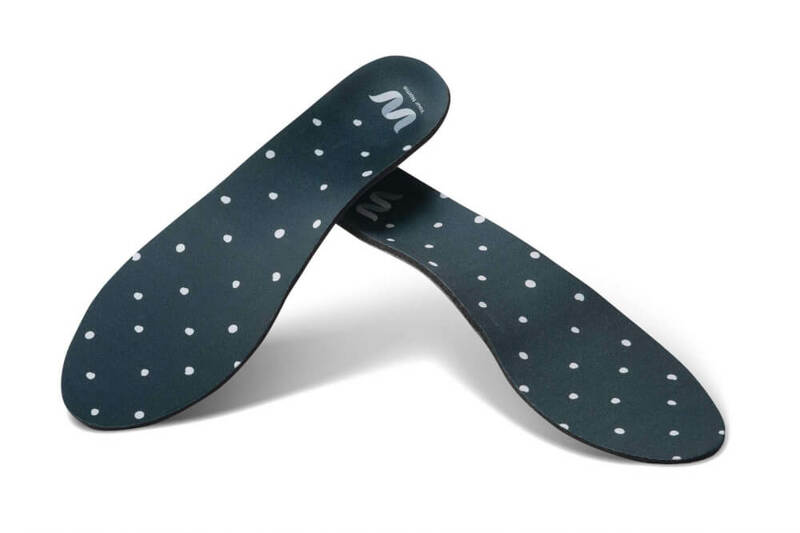 Each insole has a custom orthotic built inside that helps support your foot, relieve pressure, and provide a healthier alignment. They are especially designed for adults who suffer from Plantar Fasciitis, foot fatigue, flat feet, high arches, or knee, hip or back pain. The first thing you need to do is download the app. You’ll set up your account and then it will prompt you to take photos of your feet. It will give you very specific instructions on how to take the photos. 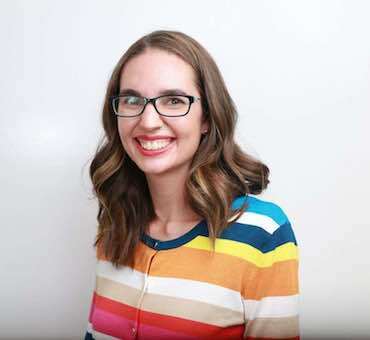 Tip: Make sure you are standing against a wall the does NOT have a baseboard or you will have to retake the photos. Trust me! 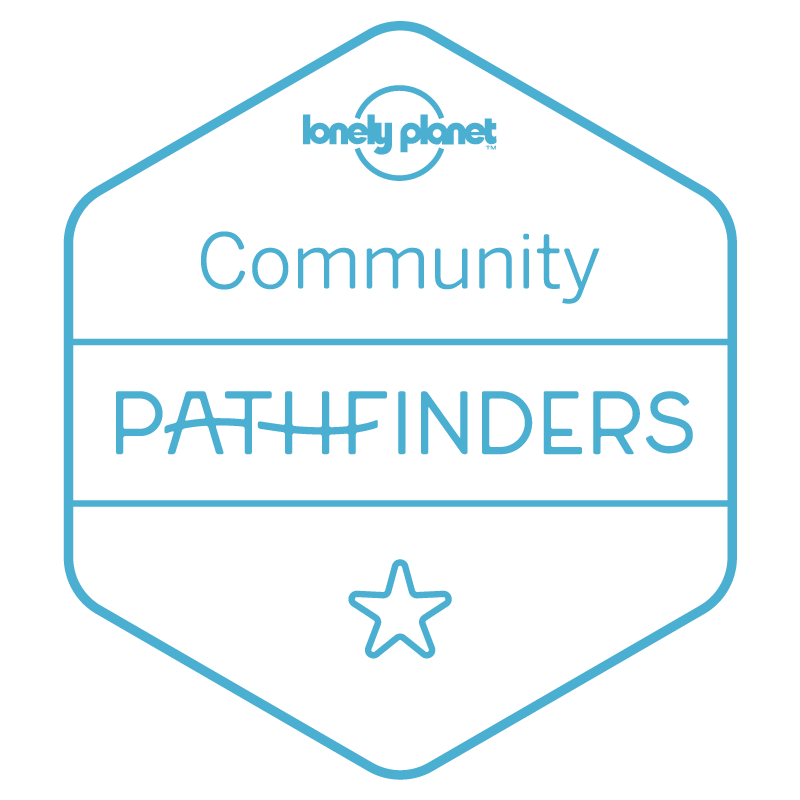 Send in the photos through the app and wait for them to be approved. Mine weren’t approved the first time because my foot wasn’t all the way against the wall. 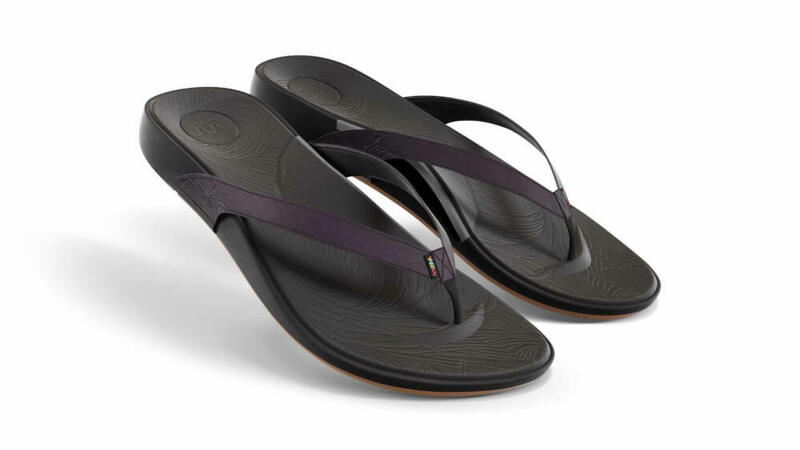 In terms of looks, there are a couple of ways you can customize your Wiivv sandals. First, you can change the color of the strap. Your options are black, navy, plum, or brown leather. Second, you can add a pop of color to your arch support. Your color options are black, grey, teal, or coral. 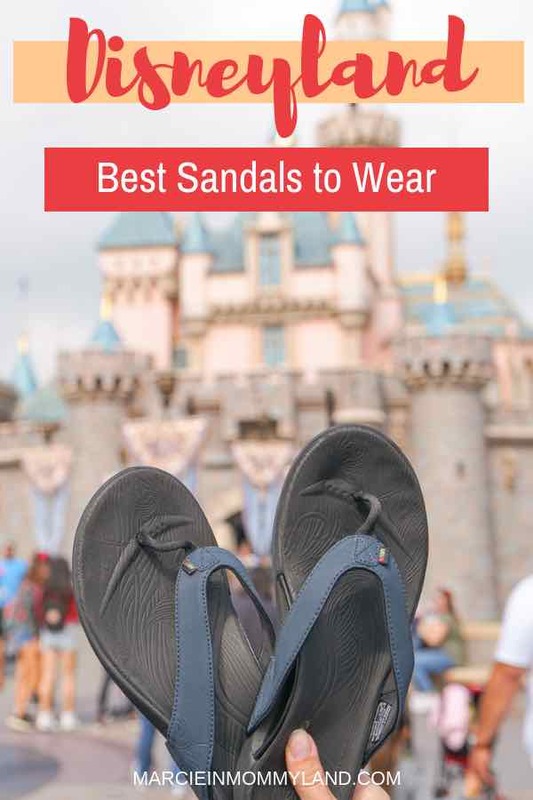 For me, I chose completely black sandals because I figured they’d be the most versatile sandal for Disneyland. I like to wear colorful dresses and skirts and I wanted to make sure they would look great with every outfit. When you get your Wiivv sandals in the mail, try them on to see if they fit correctly. If they feel a bit loose, you can tighten the strap until they feel right. I love this feature because I’ve donated countless sandals because they felt like they were going to fall off my foot, which made me drag my feet a bit. One thing I love about Wiivv is that they don’t want their sandals ending up in a landfill. So, once you have gone on your adventures and worn out your sandals, just mail them back to Wiivv. They can use them to create new sandals. How cool is that? When I first tried them on, I wore them to our mailbox. By the time I got back home, I wanted to take them off. I have super flat feet and any arch support makes my feet feel sore because I’m just not used to it. But, after wearing orthotics off and on since I was a kid, I knew I had to break them in. So, I wore them to get the mail every day. Then, I started wearing them when I went to pick up my son from preschool. Pretty soon, I was running errands in them and wearing them for walks around the neighborhood. It took about a month of wearing them a bit each day for them to feel comfortable. I’m really glad I broke them in because once my feet got used to them, I didn’t want to wear any other flip flop. It was much warmer and more humid at LEGOLAND than I was anticipating. So I ended up wearing my Wiivv custom sandals both days we were there. 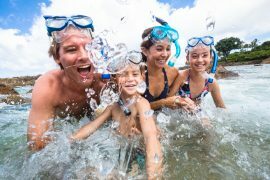 Find awesome LEGOLAND deals here. That was a smart choice because there were a few fountains to play in and rides in the water where I was glad to have waterproof footwear! Our first day at Disneyland, it rained all day long, so my sandals stayed at the hotel. I mean, yes they are waterproof, but I didn’t want my toes to be wet all day long. 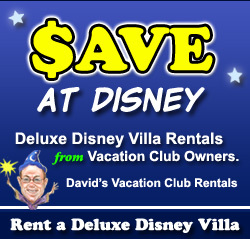 Find the best Disneyland Resort deals here. I wore them from 8am-10pm (a FULL day at both parks!) and my feet didn’t hurt at all! That is a first for me! I mean, I didn’t even need to sit down to take a break! I forgot I was even wearing sandals until our walk back to the hotel. But, not everyone likes to wear sandals at Disney Parks. 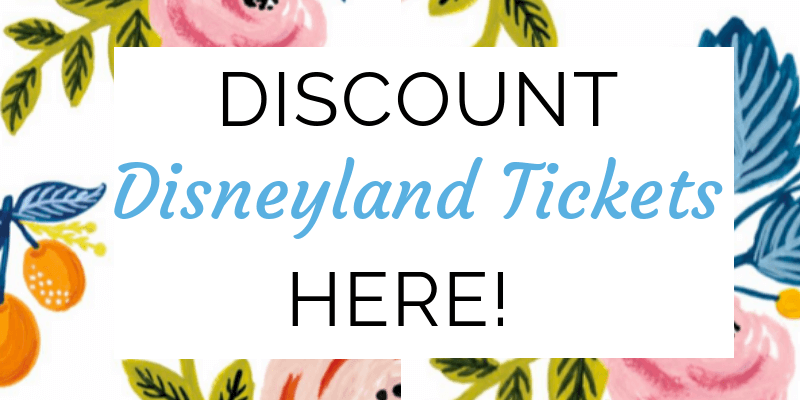 I’m mainly writing this post because I’m in a bunch of Facebook groups for people planning Disney vacations. 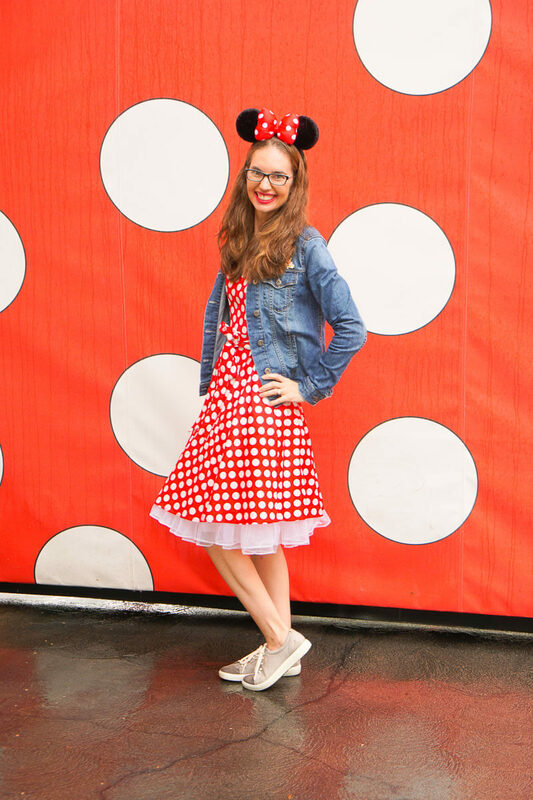 One of the top questions I see is about what are the best shoes to walk around Disneyland. 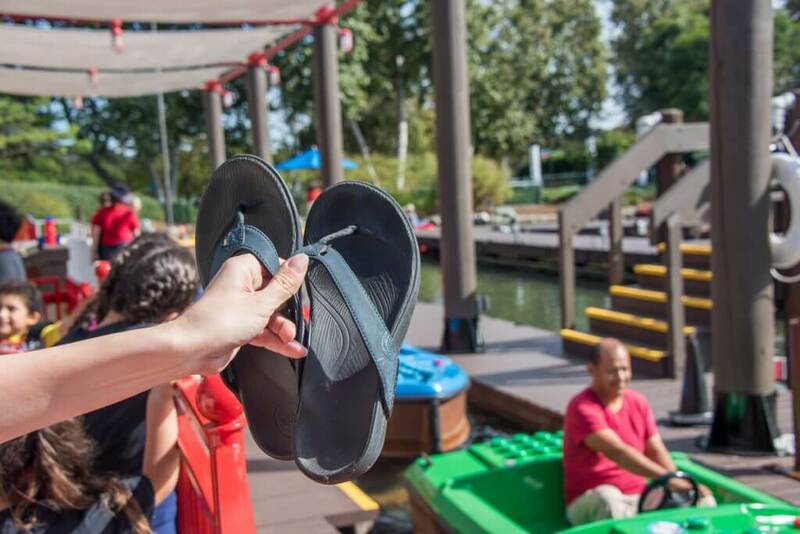 Some people feel more comfortable wearing closed toe shoes, especially on the rides. People in those Facebook groups usually suggest specific athletic shoe brands. But, I know from experience that there isn’t one brand that fits the same for every foot. Just because a brand works for my wide, flat feet doesn’t mean it will fit your narrow, high-arched feet. So, my advice is to pick shoes you actually want to wear and that fit your feet. You don’t want them to be too tight or you might get blisters. Walk around and make sure they don’t rub your feet or slip off when you walk. You can add things to your shoes to help with that, but it’s best if you find shoes that don’t require them. 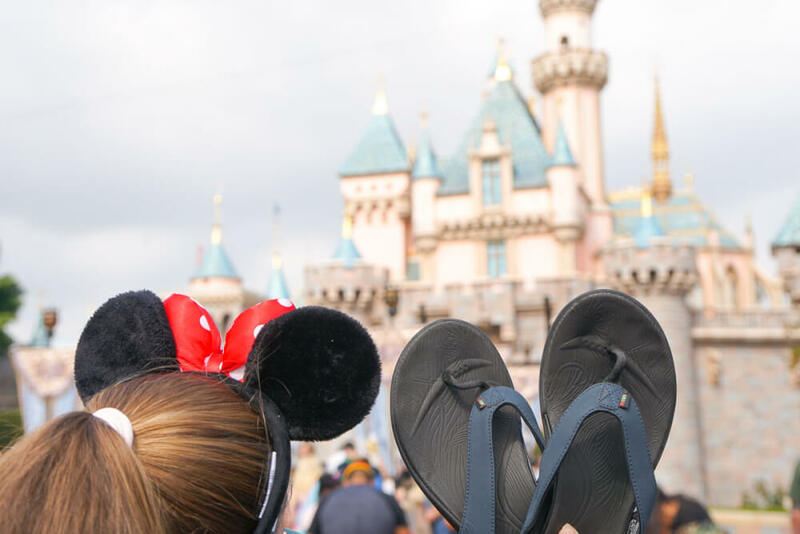 Insider tip: Don’t wear brand new shoes to Disneyland! Make sure they are completely broken in for maximum comfort. And bonus points if they look cute! So, I like to choose shoes that are comfortable but also work with my Minnie Mouse skirts. But, here’s my big secret: I wear custom insoles! uses a 3D printer to create custom insoles that you can use with any shoe. They come in a lot of different prints like stars, waves, confetti, clouds, etc. Right now, they have a moustache print that is fantastic and raises money for men’s health! I chose the floral print because it’s girly and I’ve never had girly insoles before. Plus, I knew that I’d be wearing them in lace up shoes and no one would see the floral but me. They come in both full-size and 3/4 size so you can find a pair that works with the type of shoe you frequently wear. I like that they are super lightweight yet totally supportive! It’s so hard to find comfortable footwear when pregnant. I remember my feet swelling up a bit and the only comfortable shoes were flip flops. But, they didn’t provide much support, which made my knees hurt, which made my back hurt, and pretty soon everything just hurt. 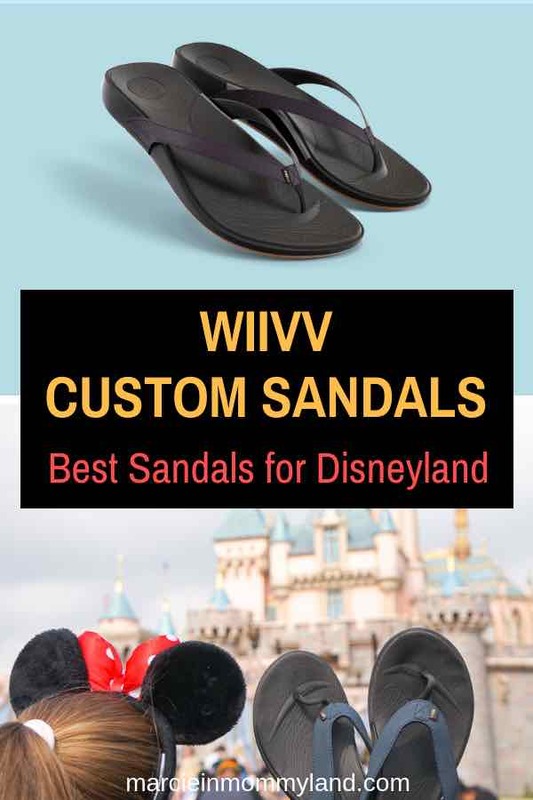 I wish I would have know about Wiivv custom sandals when I was pregnant at Disneyland a couple years ago! I think they would have helped my energy level! And they would have given me the support I needed to walk around all day! A huge thing to think about when deciding on your Disneyland footwear is how much walking you’ll do. Yes, you’ll be spending most of your day on your feet inside the park. But, a lot of people forget about walking to and from their hotel! The city blocks near Disneyland and HUGE and it can take 20 minutes just to walk to the entrance to the Parks. There are a ton of perks to staying on-property. A big one is that your purchases can be sent to your room, so you aren’t lugging stuff around the Parks. Plus, they usually have incredible kid-friendly areas in the lobby and on-site Disney character dining! This is an awesome place to stay because they have their own entrance to the Parks! Plus, the amenities and decor will have you relaxing in no time! This is home to the famous Goofy’s Kitchen character breakfast and dinner! 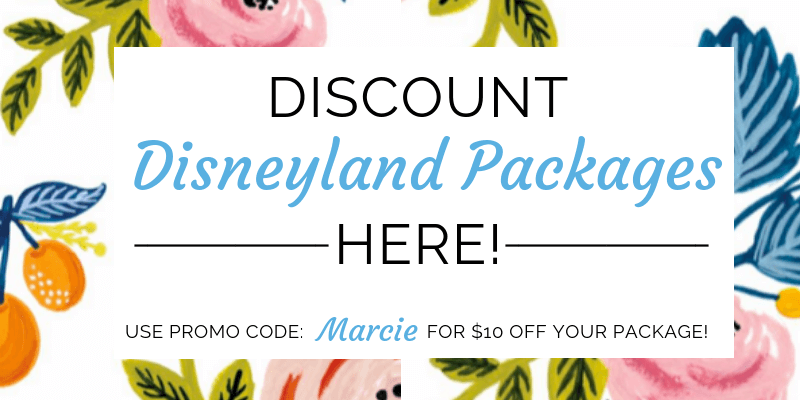 Love their decor and you’ll feel like a Disney princess here! We stayed here on our first trip and we appreciated how close we were to Downtown Disney and the Parks. If you want to save some money, try staying at one of Disney’s Good Neighbor Hotels. These are off-property, but many are super close (like across the street) to the Park entrances. I think this might be the closest hotel to the Disneyland Parks entrance. It’s right at the pedestrian crosswalk. Your feet will thank you! We stayed here on our most recent Disneyland trip and it’s just a few steps further than the Best Western. The rooms are a bit dated, but it’s perfect if you are planning on just sleeping there. They have free breakfast plus, there’s a Cold Stone Creamery! We stayed here last year and we LOVED it! The rooms have an updated Disney vibe and they are quite spacious. We like the lobby area, especially with kids. Ooh, and there’s a Panera Bread in the parking lot! The rooms look super cute and full of Disney cheer! They don’t offer free breakfast, so I’d pack food to save money! We haven’t stayed here yet, but it’s on our list. Their pools look incredible and would be an awesome place to stay if you have some “chill” days during your vacation. While it’s not the most updated hotel, it’s pretty close to Disneyland. Plus, you can watch the fireworks from their hot tub! 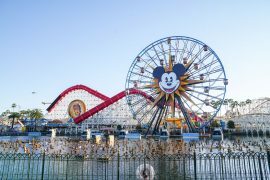 While this is slightly further away (like a 10-12 minute walk from the security area at Disneyland) this is where you want to stay for updated rooms and free breakfast! Thanks to Wiivv for providing me custom sandals and insoles in exchange for an honest review. All opinions are my own.